So yesterday I attended a production of Grand Theft Ovid at The Brick theater in Williamsburg. 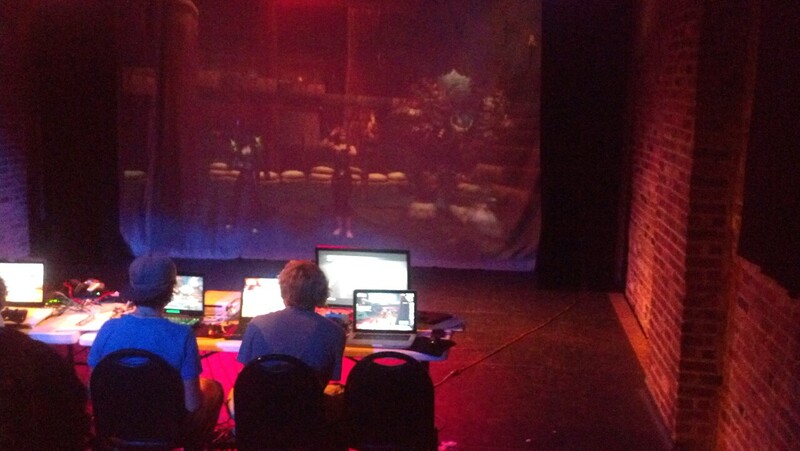 It was a staging of five portions of Ovid’s Metamorphoses, but using video games as the medium. Actors read the lines and recount the Roman epic, but instead of actors performing the scenes, clips from video games (some pre-recorded, some played live) are shown to accompany the poem. For the most part, it feels like the creators started with the poem, and then looked for scenes from video games that matched the scenes described in some way. This creates obvious humor, as there’s a strong word-tone contrast between the heavy mythological epic being read and the pixelated antics on screen. But to what end? The first act tells us of Cadmus, and introduces the format to the audience. When Cadmus is unable to find his sister Europa and thus is exiled, we’re shown Mario finding that the princess is in another castle. When he’s told to find an unburdened cow and follow it, we’re shown Goat Simulator. The warriors risen from dragon’s teeth are depicted as a fight from Mortal Kombat, etc etc. The second act tells of Actaeon, a poor schlub who accidentally sees the goddess Diana naked and is turned into a stag and killed by his own dogs. This is largely staged in World of Warcraft, and though some of the pan shots of Actaeon being run down by his dogs did successfully provoke the feelings of injustice and sadness that the poem seeks to create, it still didn’t resonate with me. It had the feel of a funny (and weird) Youtube video, not of an artistic presentation. This is especially so in the last act, the story of Niobe, in which Apollo murders Niobe’s fourteen children. It was told entirely in Halo: Reach, with Apollo’s arrows represented by a sniper rifle. At best, it felt like a particularly bizarre episode of Red vs Blue. The third and fourth acts did however have some glimmers of the sublime. Act three was the story of Phaethon, the hapless son of Apollo who crashes his Dad’s chariot, which is one of my favorite myths. It was largely staged in Minecraft, to great effect. Rather than the largely random clips of Cadmus, or the flat WoW staging of Actaeon, this felt like something actually approaching theater. The limitations of the medium- blocky characters with limited range of movement- prompt exaggerated movements of guilt and shame but were sufficient to depict the narrative. I thought the use of first person perspective was fascinating though. When a friend tells Phaethon he’s surely not the son of a god, he lowers his head in shame and thus we, the audience, lower our heads also. That’s a very direct way to create an emotional response in the audience. But the chariot ride itself was shown as a fighter plane from Grand Theft Auto 5, which returned the staging to feeling like a funny video. In act four, “Echo and Narcissus” made great use again of the first person perspective- when Echo is following Narcissus through the woods but afraid to approach him, we the audience see things from her perspective. This is really intimate storytelling: rather than witnessing the events as an outside observer, which is the premise underlying most all theater, we witness it instead as a participant, and become a party to the feelings of fear, forlorn love and disappointment. But why Call of Duty as the medium? The omnipresent gun held before Echo does nothing for the scene, and the perspective could be provided better by other games (or by film). I think the production also failed as ‘theater’, since so much of the dialogue and scenes were pre-recorded and so little was being done live (besides the arrangement of playing the clips). Why perform it live then? I think there’s obvious promise and some real artistic merit in some of the choices made, but I’d be more excited to see something like “an entire play staged in Minecraft and then played live”, than “random clips from Video Games are montaged on top of Ovid.” The creators are perhaps hoping to evoke Ovid’s opening line, “I intend to speak of forms changed into new entities,” but the crucial difference is that the transformations Ovid speaks of all have a point. The forms transformed here by EK Theater didn’t feel as wrought with care. But even with its failings I thought it was a great experience. The premise of retelling classic stories through playing of games is original and shows an interesting application of the video game form in conveying narratives. Ultimately, like it says on Phaethon’s gravestone: it was a great attempt, even if he did not manage it.